Migrants from Senegal have gained renown for their mobility, especially to European destinations. In 2010 Senegalese migrants accounted for more than 4% of migrants born in sub-Saharan Africa living in OECD countries, while Senegal accounted for less than 1.5% of the total population of sub-Saharan Africa. Senegalese migrants were the largest sub-Saharan African migrant group in Italy and Spain in 2010, accounting respectively for 23% and 27% of all sub-Saharan migrants, and the third-largest such group in France, accounting for 13% of the population born in this region. Senegalese also made up a significant share of the overall foreign-born population in these three destination countries: almost 1% in Spain, 1.3% in Italy, and 1.6% in France. While Senegalese migrants have established a presence overseas, they have also profoundly shaped the economy and culture of Senegal. Not only does Senegal rank third in sub-Saharan Africa in the total volume of cash remittances received, but a “culture of migration” has emerged in Senegal that values the economic and social contributions of emigrants. Senegalese migrants themselves also remain connected to Senegal for their sense of social status. While prior research has demonstrated the importance of this migrant group, scholarship has not fully grappled with the role that legal status plays in the lives of Senegalese migrants. Research on Senegalese in Italy, for example, has shown the importance of “transnational livelihoods” for their economic success and ongoing connections with Senegal, but this research has not investigated how lack of fully regular legal status may impede this strategy. Other studies have shown the importance of maintaining transnational connections for the social status of Senegalese migrants, yet only suggests the potential constraints that irregularity of legal status might place on physical mobility and other cross-border actions. The lack of sustained attention to legal status among Senegalese migrants is all the more surprising given the configurations of irregularity that Senegalese migrants have faced over time in their main destination countries. Immigration policies in France, Italy, and Spain have consistently created the legal conditions for irregularity among Senegalese migrants, as evidenced by their overrepresentation in regularization programs in Italy and Spain and their participation in the sans papiers movement in France in the 1990s. This book has examined the determinants and impacts of complex forms of irregular legal status among Senegalese migrants in Europe. 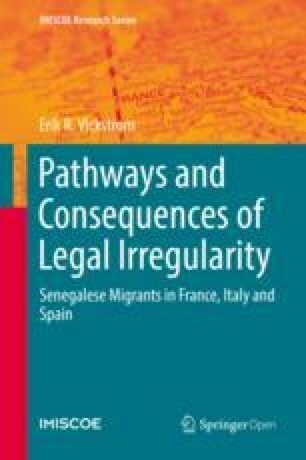 It elucidated how multiple contexts of reception produce pathways of irregular legal statuses among Senegalese migrants in France, Italy, and Spain and how the resulting complex pathways of irregular status shape the economic integration of Senegalese migrants into their host societies as well as their ongoing participation in the development of their homeland. The three parts of the book have taken an articulated approach to these topics and have drawn on both legal texts and the unique Migration between Africa and Europe (MAFE) survey. The first part sketched the legal histories of the immigration policies facing Senegalese migrants in France, Italy, and Spain and the resulting configurations of irregularity that these policies created. The second part empirically examined the pathways into these different configurations of irregularity among Senegalese migrants using the MAFE data. The third part sought to understand how different configurations of irregularity constrain the economic and transnational activities of Senegalese migrants. Chapter 2 laid the historical foundations for this research by tracing the evolution of immigration policies and the mechanisms of external and internal control (Brochmann 1999) they define in the main European destinations of Senegalese migrants: France, Italy, and Spain. Immigration-control policies have played an important role in structuring the migration strategies and incorporation of Senegalese migrants in France, Italy, and Spain. In France, there has been an evolution from colonial-era political and personal “assimilation” of Senegalese to the French nation; to a post-independence preferential regime that put few restrictions on the ability of Senegalese to enter, reside, or work in France; to a gradual erosion of the Franco-Senegalese bilateral relationship and an alignment with the general immigration-control regime. Senegalese in France thus had de facto regular status for much of the 1960s and 1970s in that they did not need explicit authorization to enter or reside in France and were able to take advantage of common post facto regularization procedures. Irregularity became more common among Senegalese as this preferential regime crumbled, and the participation of Senegalese and other Africans in the sans papiers movement in the mid-1990s highlighted the extent to which changes in immigration-control legislation had created precarity in their legal statuses. The evolution of immigration-control policies in Italy and Spain took a much different trajectory. Spanish and Italian apparatuses of immigration control are much more recent: neither had any national-level immigration policy with the normative status of legislation until the 1990s. Irregularity seems to have been a consistent component in contexts of reception in Italy and Spain, as their frequent and massive regularization programs demonstrate. Much of this irregularity seems to stem from the mismatch between restrictive immigration-control measures and structural demands for cheap, low-skilled labor (Finotelli and Sciortino 2009; González-Enríquez 2009; Reyneri 2003). Partly as a result of this mass irregularity, immigration-control policy in both countries has since developed in a restrictive fashion, marked by an overriding concern with border control along Mediterranean coastlines. In tracing these differential evolutions, Chap. 2 underlined that the legal status that migrants possess is a relational product (Sciortino 2004): interaction between a state’s policies and a migrant’s strategies creates different kinds of administrative statuses. Immigration policies and their control mechanisms have thus created legal parameters that define the legal pathways that migrants navigate. Chapter 3 examined the pathways into irregular statuses among Senegalese migrants in Europe. Drawing on literature that argues for both multidimensional definitions of irregularity and recognizing the important role that socio-legal contexts play in setting the parameters of irregularity, the chapter hypothesized that context, measured by both destination and period, would structure both geographic and status flows into irregularity. The chapter also hypothesized that pathways of irregularity would be linked, and that forms of capital and links to host-country institutions would also be correlated with irregularity. Retrospective life-history data from the MAFE-Senegal project was used to study the determinants of the pathways into irregularity of no-visa entry, overstaying, and befallen irregularity. Senegalese migrants going to Italy were the most likely to have entered without a visa, while overstaying was more prevalent in southern Europe than in France. These results thus showed that context plays a strong role in shaping no-visa entry and visa overstay, pathways that occur close in time to the act of crossing a border. These pathways are likely to be the most responsive to variation over time and across destination of the socio-legal parameters of legal status since most of these parameters have increasingly converged on preventing irregular entry. These findings support research that views irregularity of status as a “legal production” of immigration policies and mechanisms of control (De Genova 2002; Sciortino 2004). These early-trajectory pathways into irregularity are also responsive to migrants’ various forms of capital: migrants who have greater access to financial, human, and social capital are less likely to follow these paths into irregularity; migration-specific social capital in the form of prior no-visa entry facilitate current no-visa entry, but an increase in the number of previous trips protects against first-status irregularity. Migrant agency thus also structures the pathways that they take or manage to avoid, buttressing other findings in the literature that understand state structures as conditioning migrant action but not completely constraining them (Bakewell 2010; Coutin 1998; Sciortino 2004). Changes in legal status, such as befallen irregularity, are more responsive to links to institutions in the destination country, such as the labor market, suggesting that migrants participate actively in avoiding pathways into irregularity as part of a project of integration. Unemployment is, somewhat paradoxically, related to decreased probability of loss of regular status, which suggests that the link between labor market participation and legal status depends crucially on whether or not the migrant works in the formal sector (Reyneri 2003). In addition to findings on context and links to institutions, Chap. 3 found that previous legal status was an important predictor of all of the pathways. This supports the emerging view in research on legal status that a static binary measure of legal status is not sufficient to capture the complexity of legal status categories and transitions over migrants’ life courses. This chapter thus contributes to the call for disaggregating legal status (Donato and Armenta 2011) and examining connections between different kinds of legal status. Chapter 4 examined how immigration policy creates gendered channels of access to destination societies’ labor markets. The chapter hypothesized that the effect of legal status on economic incorporation would differ for women and men: women’s legal statuses are more likely to be the product of dependency-inducing family reunification policies that disincentivize work (Boyd 1989; Kofman 1999), while men would have more options for labor-market access regardless of legal status (Kogan 2006). Women’s labor-market participation would thus be structured by their legal status, with those women reunifying with spouses at a destination less likely to work upon arrival than autonomous women or men (Lesselier 2008). At the same time, the chapter hypothesized that female reunifiers may also have an easier time making eventual transitions into the labor market (Kanaiaupuni 2000). The results indicated that Senegalese women with configurations of legal status indicative of family reunification were more likely than women with other legal statuses to be economically inactive upon arrival, while there is little association between Senegalese men’s legal status and their participation. This finding held across destination countries despite the differing configurations of legal status granted to reunified spouses: while mixed status among women was associated with higher inactivity in Spain and Italy, so was fully regular status in France. This is consonant with research that finds that reunified spouses tend to be less likely to be economically active (Kofman 1999). In the case of Spain and Italy these women face legal barriers to their participation as a result of waiting periods (Kofman 2004). Women in France, however, do not face such barriers, meaning that their legal situation is also indicative of economic dependency (Lesselier 2008). The chapter also found, however, that family reunification does not preclude labor-market participation, as many of the women with family-reunification profiles eventually transition into economic activity. This finding echoes the observation that family migration may transform into a form of labor migration (Kofman 1999). It also supports the view that women migrants have a diversity of motivations for their migration, and may often strategically participate in an “associational” move for economic reasons (Kanaiaupuni 2000). In contrast to Senegalese women, male migrants with fully irregular status (NRP_NWP) did not face any penalty in labor-market participation, employment, or the risk of transition to unemployment compared to migrants with fully regular status. There thus seems to be only a weak legal constraint of irregularity of legal status on economic activity for Senegalese migrants in Europe., This finding echoes research that demonstrates that immigrants to countries high labor-market informality and demand for low-skilled labor may reduce the immigrant “employment penalty” (Kogan 2006), but may also channel immigrants into “bad jobs” (Fullin and Reyneri 2011). Chapter 5 considered the constraint that irregular legal status might impose on the cross-border activities of Senegalese migrants in their main contexts of reception. While the literature on transnationalism has often lauded the ability of migrants to subvert state authority via their cross-border activities, this chapter argued that state action needs to be brought back into the analysis of transnationalism. It proposed that state action works most directly as territorial confinement (Waldinger 2008): those migrants who lack secure legal status are unable to cross physical borders at their will. The chapter also hypothesized that lack of regular legal status would impede migrants’ ability to cross various institutional boundaries that would block their non-mobile transnational activities (Portes and Rumbaut 2006; Van Meeteren 2012). The chapter sought to understand the link between mobile and non-mobile transnational activities by drawing on literature that argues for the importance of physical co-presence in building and sustaining affective and trusting relationships (Urry 2002) and thus hypothesized that physical visits to the homeland would facilitate non-mobile transnational activities. Finally, the chapter hypothesized an indirect constraint of irregular legal statuses on non-mobile activities operating through territorial confinement: migrants without the ability to make visits to the homeland are less likely to be able to maintain social ties that depend on occasional physical co-presence, and are thus less likely to participate in non-mobile transnational activities that depend on active social ties. The chapter used the MAFE data and its information on Senegalese migrants’ transnational activities directed towards their homeland in the form of short returns, remittances, investments, and participation in hometown associations (HTAs). The results of Chap. 5 unambiguously supported the territorial confinement hypothesis: Senegalese migrants with fully irregular or mixed statuses were significantly less likely to make short returns to the homeland. This finding supports Waldinger’s (2008) contention that nation states play an important role in structuring and constraining migrants’ cross-border activities. The results of the chapter also supported the hypothesis that migrants’ transnational activities can be blocked by their lack of secure legal status and the exclusion from other formal institutions that ensues. Fully irregular status operated as a direct constraint on remitting, investing, and HTA participation for Senegalese migrants. While the exact mechanism of this juridical constraint on non-mobile activities remains to be explored, the finding of structural exclusion is in line with previous findings (Portes and Rumbaut 2006; Van Meeteren 2012). Chapter 5 also offered evidence for a positive relationship between visits to the homeland and non-mobile transnational activities. This is a relationship that the literature on transnationalism often implies (Portes and Zhou 2012; Smith 2006) but rarely directly examines. This form of mobility, along with other affective links, is thus of crucial importance in explaining these financial forms of non-mobile transnational activities. The link between physical mobility and non-mobile activities provides the theoretical lynchpin for the hypothesis of an indirect, negative effect of irregular legal statuses on non-mobile transnational activities. This indirect effect was evident for remitting and investing, meaning that their non-mobile actions were indirectly caged by the irregular status that led to their territorial confinement (Waldinger 2008). The juridical constraint was thus transmitted through the inability to circulate between destination and origin. Migrants who have irregular status thus face three kinds of legal constraints on their cross-border actions: a direct legal constraint on their physical mobility, limiting short returns to Senegal; a direct legal constraint on their formal institutional participation, limiting their remitting, investing, and HTA participation; and an indirect legal constraint on their remitting and investing through their inability to visit home and the concomitant curtailing of social ties. Finally, the chapter offered further evidence that different transnational activities, while often taken as a monolithic object of analysis, have different determinants and do not necessarily cluster together (Waldinger 2008; Van Meeteren 2012). While remitting and investing are part of a household strategy of migration and are responsive to short visits and other affective links, HTA participation is a collective activity and, as such, seems to be less responsive to physical co-presence in Senegal and affective ties to the homeland. These chapters have drawn on the rich information available in the MAFE-Senegal dataset to complement the analyses of legal status with other contextual and individual predictors of action. The results indicate that lack of secure legal status can serve as important legal constraint on the actions of migrants (Sciortino 2004) and contribute to the growing research literature on legal status as an important axis of stratification in modern societies (Massey 2007; Menjívar 2010). The results also demonstrate that legal status constrains but does not completely determine migrants’ actions (Van Meeteren 2012). This is an important point of articulation with the body of research that considers the tension between structure and agency in migration research (Bakewell 2010; Goss and Lindquist 1995). While this book cannot attempt to offer a resolution to a tension that marks most fields of social inquiry, the results nonetheless support the view that social action may be structurally conditioned but not totally structurally determined (Bakewell 2010). 6.5 What Is Irregularity and Why Does It Matter? The early pages of this book asked the question, “What is irregularity?” While the answer focused on the lexical differences between a variety of terms capturing different forms of irregularity often used interchangeably, the discussion highlighted the lack of theoretical precision often underlying sociological work focusing on migrant legal status. The first and second parts of this book took this imprecision as an opportunity to examine more deeply different configurations of legal status among Senegalese migrants, in terms of both their historical creation via immigration policies and the pathways via which Senegalese migrants enter them. The third part of the book tackled a different question: how does irregularity matter? How does it constrain the actions of Senegalese migrants? Chapters 4 and 5 thus confronted additional theoretical hurdles involving concepts of economic and transnational activities. This section will consider the contributions that this book has made to theoretical progress in the study of irregular migration, migrant economic incorporation, and immigrant transnationalism. “Theory” here is defined as the definition and systematic linking of concepts that reflects accumulated knowledge and leads to new research in a given field of inquiry. As Portes (1997) argues, the field of migration research has both been blessed and limited by a reliance on the accumulation of empirical data and the avoidance of grand theorizing. The rich array of source material at multiple levels of analysis generated by a variety of methodologies has helped build the study of migration into a flexible and expansive enterprise, while the diversity of cases has helped the field avoid overly grandiose single and encompassing theories of migration. At the same time, Portes (1997) warns of the risk of empirical results accumulating without a systematic theoretical guide to future research or to policy-making. Some of the lack of theoretical advancement in migration research has come from a mishandling of the fundamental building blocks of theory, such as concepts, empirical generalizations, typologies, and theoretical propositions. For Portes, a proper theory must contain interlinked and falsifiable theoretical propositions that specify relationships between concepts. Furthermore, theory must “travel”; that is, it must be able to provide insight into social realities under conditions which may differ from those that hold for the case at hand. In this way, theory can leverage the empirical richness of empirical case studies to guide the development of new insights. While this book has drawn on data on Senegalese migrants in Europe for its empirical analyses, it can also offer some modest contributions to theoretical progress through the refinement of some basic building blocks of theory that advance understanding of the production and consequences of migrant irregularity. Concepts privilege certain parts of empirical reality as worthy of investigation and thus constitute the fundamental building block of theory. This book has privileged the concepts of “legal status” and “irregularity.” As Chap. 3 argues, there is a considerable conceptual muddle in the study of legal status and irregularity. This muddle stems, in part, from a lack of clarity in the unit to which these concepts refer. The imprecision of the term “irregular migration,” for example, arises from the lack of identification of the unit of analysis of which irregularity is a property: migrants can have irregular legal status, but entire flows or stocks of migrants are unlikely to be irregular. Furthermore, the rules of correspondence linking this concept to its empirical indicators are often unspecified, leading to a multitude of sometimes contradictory uses of the concepts. For example, “irregularity” often gets conflated with “unauthorized border crossing” when, in reality, this form of entry constitutes one many ways in which migrants can become irregular. This book contributes to the refinement of the concepts of legal status and irregularity by proposing theoretical and empirical operationalizations that clarify both the unit to which the concepts refer and their rules of correspondence. By drawing on emerging literature on the multidimensionality of legal status, this book was able to define irregularity at the theoretical level in terms of the lack of one or more authorizations in multiple legal domains at different points in time. This is a nominal theoretical definition that was useful for this book but did not aspire to capture the “real” essence of irregularity. At the same time, it clarified the relationship between irregularity and the various legal domains of immigration-control mechanisms and the time-varying nature of different authorizations over a migrant’s stay in a destination. This nominal theoretical definition led to an empirical operationalization of the different pathways into irregular status: no-visa entry, overstaying, and befallen irregularity reflect concrete combinations of different statuses in different legal domains. This approach allowed the analyses to overcome the conceptual muddle surrounding irregularity and has helped to put this concept on firmer theoretical and empirical ground. The empirical findings demonstrated that it is crucially important to disaggregate binary measures of legal status. Relying on a dichotomy of documented vs. undocumented status would have obscured important variation in pathways into different forms of irregularity and in the impacts of irregular statuses on economic incorporation and transnational activities. These results also demonstrate that sensitivity to changes in legal status over time is crucial for modeling the determinants and consequences of different forms of legal status. Many studies do not incorporate time-varying measures of legal status and thus miss this important source of variation. This book has also made a conceptual contribution to the field of immigrant transnationalism in its distinction between “mobile” and “non-mobile” transnational activities. The literature on immigrant transnationalism has defined its object of study as the ongoing connections between migrants living abroad and their home communities, often operationalized in the form of discrete activities that take place across national borders. While the literature has differentiated activities by their field of action—social, cultural, economic, or political—it has often ignored the physical and geographic specificity of such actions. Some actions labeled as transnational do not necessarily directly involve the physical movement through space, such as remittances, while others, such as homeland visits, do necessarily involve such movement. The book thus proposed a nominal theoretical definition that distinguishes these types of activity. While this nominalist definition leaves the door open to other conceptualizations, it makes an important contribution to a research field that has tended to ignore physical mobility, physical co-presence, and legal status. A final conceptual contribution comes from Chap. 4’s examination of migrant economic incorporation, which proposes a typology of configurations of legal statuses indicating different types of migrants. This typology was necessary in order to highlight not only the gendered implications of immigration policy, but also the different ways in which these gendered policies get translated into concrete configurations of work and residence authorizations. Without this typology, it would be impossible to understand that reunified migrants in France have a different set of legal rights than reunified migrants in Spain or Italy. Thus, the meaning of configurations of legal statuses varies across countries with different immigration-control regimes, and the typology proposed makes it possible to compare similar types of migrants in different legal contexts. As Portes (1997) makes clear, these kinds of typologies are important theoretical building blocks in migration research. The results of this book point to the operation of unintended consequences of immigration policies pursued by the receiving states of France, Italy, and Spain. First introduced to sociology by Merton (1936), the idea that social action such as immigration policy can have unanticipated effects has been a cornerstone of analyses of American immigration policy (Massey et al. 2002; Portes 2000). These analyses have shown, for example, that efforts to stem undocumented migration to the U.S. by securing the southern border have not only failed to slow undocumented border crossings but also have contributed to a growing stock of undocumented migrants living in the U.S. by decreasing their probability of return (Massey et al. 2002, 2016). Similar unintended consequences are evident for Senegalese migrants in Europe: when France closed its borders to labor migration in the 1970s and stiffened the bilateral agreement regulating Senegalese migration, Senegalese responded in part by settling in France reunifying with wives and children, thus putting an end to a previously circular system (Timera 1997). This book traced in depth the evolution of these immigration policies and sought to understand how policies that sought to limit irregular migration actually produced new pathways into irregular status. Quantitative analysis of these pathways revealed that irregularity was more common in destinations and periods where restrictive controls were put in place. Moreover, these analyses showed that migrants bring a variety of resources to bear in circumventing control strategies. Policies thus produced new forms of irregularity instead of limiting irregular migration. Additional empirical results indicate how these unintended consequences of immigration policy influence the lives and actions of Senegalese migrants in the main receiving countries in Europe. Irregular legal statuses largely fail to accomplish their intended goal of preventing migrants from working. In addition, legal statuses operate more strongly on women’s economic incorporation, with legal status configurations associated with family reunification increasing women’s economic and administrative dependency via reduced labor-market participation. Legal status thus renders a vulnerable population more vulnerable. While results show that restrictive immigration policies do not necessarily stop migrants from entering, residing, and working irregularly in France, Italy, and Spain, Chap. 5 shows that these statuses do act as a constraint on their ongoing participation in their homeland. Lacking regular status prevents Senegalese migrants from returning periodically to Senegal and thus also indirectly negatively affects their ability to participate in financial, non-mobile transnational activities because the lack of occasional physical co-presence causes social ties to wither. The lack of ability to circulate between destinations and the homeland effectively short-circuits the vaunted Senegalese “transnational livelihoods” (Kaag 2008; Riccio 2008). As Chap. 5 showed, restrictive immigration policy has thus transformed migrants initially focused on circulation and eventual return into irregular long-term settlers who risk exclusion and marginalization. This marginalization is clearly not in the best interests of the destination society, the homeland, or the migrants themselves. The destination societies spend huge sums of money guarding borders in a time of severe fiscal austerity, yet they are unable to eliminate or reduce irregular migration; these draconian policies occur in the context of an aging population that actually needs migrant labor. These restrictive policies do, however, succeed in creating a marginalized and exploited population with few social rights who are yet unable or unwilling to return to the homeland prior to accomplishing their objectives. The inability of migrants to circulate between destination and origin also has negative effects on their home communities. Portes (2009) argues that the development potential of migration depends, in part, on the composition and duration of migrant flows. Cyclical flows of manual laborers have the potential to have a positive impact on development by overcoming inefficiencies in sending countries’ credit and product markets, transferring skills and resources, strengthening local productive structures, and preserving the demographic integrity of sending regions. This positive impact hinges on the existence of a vital community back home to remit to and develop, and cyclical flows assure that depopulation will not drain a community’s vitality. In contrast, permanent flows of manual labor lead to the depopulation of sending areas and the weakening of productive infrastructures. As the sending community empties out to be reunited with permanently settled migrants, remittances and local productivity decline. The trend towards increasingly restrictive immigration policies that confine irregular migrants to the destination territory undercuts the cyclicality that Portes sees as vital to the positive developmental impact of labor migration. The results of this book also suggest the failure of cooperative immigration policies undertaken in concert by governments of sending and receiving countries. This short-circuiting of the developmental potential of Senegalese migrants is at odds with recent evolutions in Europe to encourage and channel migrants’ transnational activities for the effective development of their homelands. Such “co-development” programs (Grillo and Riccio 2004; Weil 2002) have become de rigeur in most European countries’ official migration-management strategies (see Chapter 2 for descriptions of such programs in the most recent bilateral treaty between France and Senegal and as part of Spain’s “Plan África”). These programs have also become a part of European countries’ official bilateral cooperation with African governments, thereby implicating sending-country institutions in their efforts. There thus seems to be a contradiction between restrictive immigration-control policies that constrain economic integration and the physical and symbolic border-crossing of transnational activities and the co-development policies that leverage migrants’ economic success and ongoing connections to their homelands. At the same time, it is not at all clear that co-development policies can be separated from policies that seek to restrict migration. More importantly, as Kabbanji (2013) points out, most governmental organizations promoting co-development draw on a discourse of “managing” migration in the face of rising flows of clandestine Africans, with control of irregular migration seen by France, Italy, and Spain as a precondition for leveraging migrants’ private initiatives for the productive development of their origin communities. This technical approach conceals the fact that co-development strategies have focused on controlling African migrants’ transnational activities and promoting the return of unwanted migrants (Kabbanji 2013). Thus, border control and co-development go hand in hand with a two-pronged strategy of preventing migrants from entering destination countries and repatriating those that already live there, mostly those in irregular status. Research has also questioned the impact of cooperative migration-management efforts and co-development policies. Most co-development programs involve relatively small sums, benefit a limited number of people, and have not yet been thoroughly evaluated for their effectiveness (Kabbanji 2013). Bilateral agreements to facilitate legal migration are also constrained by the extremely limited numbers involved and the constraints faced by the participating migrants; in the case of the bilateral labor program for Spain and Senegal, very few migrants were able to participate for more than one year because renewing permits is the responsibility of the employer (Kabbanji 2013). These programs also generally fail in their goal of attracting the voluntary return of migrants in the quest for “brain gain”: quantitative research from the MAFE project demonstrates that Senegalese migrants’ probability of long-term return to Senegal has declined as economic uncertainty in Senegal and legal precarity in Europe has increased (Schoumaker et al. 2013). Part of the lack of effectiveness of cooperative and co-development programs could be due to the lack of legitimacy of sending-country governments in the eyes of migrants. The Senegalese government, while it tried to stem emigration in the 1960s through the imposition of exit visas (Kane 2011), has attempted to position itself over the last 10 years to be a more effective partner for migrant-led development. Nonetheless, Kabbanji (2013) reports that the government of Senegal, like other sending-country governments pursuing cooperative migration management, is often perceived to be facilitators of the goals of restriction and return. Senegal established the Ministère des Sénégalais de l’Extérieur (Ministry of Overseas Senegalese) in 2003 (Kabbanji 2013) with the goals of managing migration flows, guaranteeing the social and juridical protection of overseas Senegalese, and “promoting” overseas Senegalese. In reality, this ministry has drawn on discourses of the sharp uptick in illegal migration of Senegalese to Europe to step up its cooperative migration-management efforts. The Senegalese government agreed to high-profile and controversial involuntary returns of illegal migrants from the Canary Islands in 2006 (Gagrielli 2008), and the Ministry of Youth has participated in “fight” against illegal migration and in the management of the oft-criticized bilateral labor-immigration agreement with Spain (Kabbanji 2013). It thus seems that the government of Senegal, despite professions to protect migrants abroad and support their investments in Senegal, has fallen prey to the logic of “migration management” preached by EU governments. This collusion with restrictive European policies probably only adds to the pre-existing lack of legitimacy of the Senegalese government in the eyes of many Senegalese, both migrants and non-migrants alike. Recent results from the Afrobarometer project show that public trust in all branches of the Senegalese government has been declining in recent years despite a high level of support for democracy (Afrobarometer 2009). This “capacity crisis” confronts many African states and is a fundamental factor in explaining their lack of development (Englebert 2002). This lack of capacity among African states arises, in part, because of an incongruence between pre- and post-colonial political structures, and results in a neo-patrimonial ruling system, the irrelevance of the rule of law, the evaporation of trust in institutions, and increased corruption (Englebert 2000). This kind of neo-patrimonial system can also lead to a situation where communitarian association founded on the social capital inherent in extended families and ethnic networks can take the place of weak or absent coordinating institutions (Portes and Vickstrom 2011). While societies founded on this sort of macrosocial organization can function, the mechanical solidarity that substitutes for coordinating institutions can lead to a fragmentation of social order (Portes and Vickstrom 2011). This capacity crisis has a number of implications for the migration policies pursued by sending countries. Senegal is among those states that have experienced a lack of legitimacy and a capacity crises resulting from the spread of a neo-patrimonial system (Englebert 2002). Adepoju (2004) argues that this kind of lack of capacity among African states has been a fundamental driver of emigration from sub-Saharan Africa. At the same time, the social capital that fills the institutional vacuum also underlies the perpetuation of international migration (Massey 1993) and the widespread adoption of transnational household strategies of risk diversification and accumulation (Stark 1991). The overall failure of African states to acquire legitimacy and invest in human development has Africans to build their own institutions for their personal and collective goals that operate on social capital. The findings of this book support the interpretation that social capital is one of the main determinants of migrants’ continuing participation in the development of their origin communities: affective ties and the physical co-presence that nourishes them are strong predictors of migrants’ remittances to and investments in Senegal. The main obstacle that they face in this endeavor is legal precarity in the destination countries, which undermines these social connections. This is the fundamental facet of the immigration policies of destination states and sending-state policies do little to change the fundamental juridical exclusion that many migrants face. It is thus not surprising that Senegalese migrants would be wary of their state’s institutional efforts to leverage migrants’ development efforts, as it was the fundamental institutional failure of the state that led to and sustained the very act of migration. Coupled with the veiled restriction and involuntary return promoted by the cooperative migration-management policies of receiving states, there is ample reason to be skeptical about the prospects for a positive effect of co-managed migration on either migrants or their sending communities. It is ultimately the migrants themselves and their home communities that bear the brunt of this incoherence. Effective immigration policy in Europe and Senegal alike would be best served by aligning their goals to support overall human development and capacity-building and creating opportunities for economic participation and circulation between destination and the homeland.